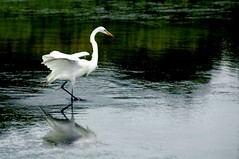 Today, from my flickr stream is a Great White Egret. I took this photo last summer - 2009 - at Fermilab in Batavia, IL. Enjoy! Last summer when we were out boating with some friends, they pointed out a spot where there were supposed to be lots of these birds to me. Unfortunately, the birds must have sensed I was there just like every other living thing does when I have a camera in my hands...lol Love the shot. Thanks Ann, sometimes you just have to go by a spot many times or just hang out for a while to catch them. :-) We have a lot here, well not in Feb but during the warmer months. You just gotta have your eyes open. I can't wait for spring.